Series Three Episode Five of the ICQ Podcast has been released. The latest news, your feedback, Hints, Tips and Tricks and Martin (M1MRB) discusses completing the building of the TenTec 1330. NAQCC - Lifetime membership FREE! Building this phase is straight forward and should not take you long to complete. Make sure you install the IC's the correct way round or you could damage the devices. Alignment of the BFO is achieved by the adjustment of L1. You adjust L1, the audio tone to suit your operating preference. The audio stage can be checked by placing your finger on the centre connector of the volume control. This will result in a hum from the load speaker is the audio amplifier is working. 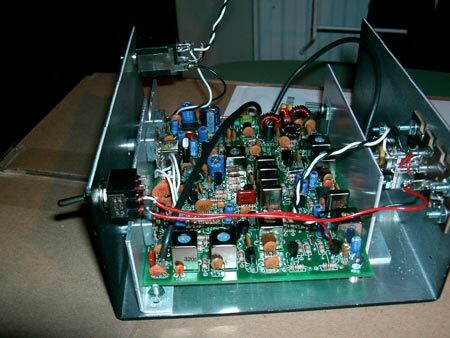 The receiver alignment consists of adjusting L6, L18, L7 and L5 for maximum received signal or background noise. Use a proper trimmer to do these adjustments because a screwdriver at best will effect the alignment, at worst you could damage the slugs in the coils. Again another simple phase to complete which you should be able to complete without problems. Make sure you install the IC the correct way round or you could damage the device. 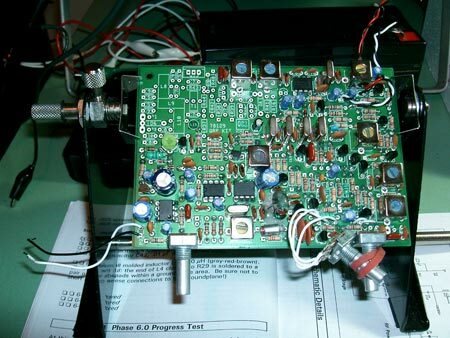 At this point the receiver is finished and is capable of receiving low-level CW keying sidetone signal. Connect the load speaker, antenna, dummy load and power. 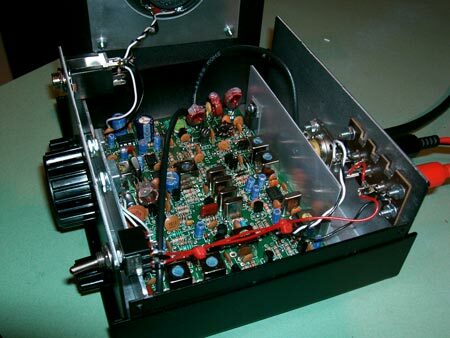 Adjust R61 and L1 so you can hear a sidetone when transmitting. This tone will be low volume at this stage but you should still hear it. Your almost complete at the end of this project. You will have to wind a number of toroid coils to complete this phase. Just follow the instructions in the manual and you should have now problems. T1 is a Bifilar transformer wire which TenTec have supplied the wire precut and twisted together. The manual shows the correct way to wind T1, L8, L9 and L10. You have the option to test this phase or not. If you do you should have an output around 100mw. This is the last phase and on completion of this phase you should end up with a working radio. You mount the chassis into the case, connect the sockets and switch before final testing. There are no difficult parts to this phase however I would fit the SO239 socket before mounting the chassis. If you do not and follow the manual you will have to remove the chassis again making extra work for you. You can now do the final alinement's before closing the case. Before I start my conclusion I would like to give you a little background about me. This will help you understand my findings. I spent ten years as a radio and TV service engineer, 26 years in the computer industry and am now working as a PMR Engineer on hand held and mobile radios. I would say that this kit is not a beginners kit, the constructor should have some kit building experience before undertaking a kit like this. I wound the VFO coil, adjusted it and sealed it to the PCB with candle wax. This did not work very well and I found the wax went brittle. I later removed the coil and and all the wax from the PCB. For this reason I would not use wax in this location again. I suffered VFO instability and had trouble setting the tuning range. I rewound the VFO coil and still could not get the frequency coverage I wanted. Then the VFO died. I found that PNP transistor Q4 (2n5087) had gone funny. While it measured OK on the multimeter ohms test, there was no volts to the VFO. I removed the transistor and connected it to my transistor analyser. This said it was a common cathode diode matrix and not a transistor. I replaced this transistor with one from my junk box and this problem is solved. 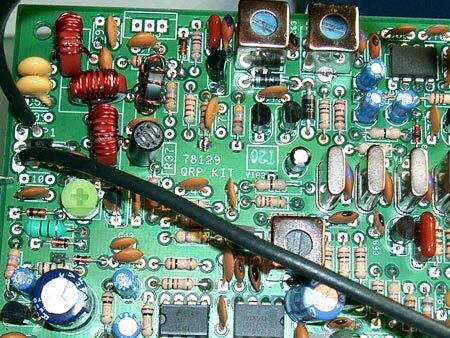 I have rewound my VFO coil a third time and once fitted and hot glued to the PCB the tuning range has gone out. The 30 metre band is between 6 and 9 on my radios tuning scale. This I will put up with at the moment because I want to get some QSO's. My radio had a major problem in the output stage. It was oscillating on tansmit between 6Mhz and 73Mhs at random with an output power of 1 watt. After doing some research on the internet I found this is caused by L8,L9 and L10 being too close together. This causes feedback in the output stage and puts the PA into oscillation. Because this is a well known problem I was surprised TenTec have not modified the kit of offered instructions of how to solve this problem. I Removed L8,L9 and L10, rewound them with longer legs and mounted them above the PCB spreading the coils apart. This solved the self oscillation. I also think this kit has the wrong type of volume control. All controls in my kit were linear 10k pots with same part number in the manual. I think the volume control should have been a logarithmic pot which would have better control over the low volume range. The kit as it is, is unusable with headphones because a small turn of the volume control nearly blows your ear drums. I think the main tuning knob could have had a white line indicator and not left to the constructor to paint a line on this control. Lastly my kit is only outputting 1.5 watts. I have followed the suggestions in the manual with no luck. This I will put up with at the moment because I want to get some QSO's. The kit as it stands I would give it a 6 out of 10. While some of the problems above were not TenTec's fault others may be. I do want this radio to work to its specification. I will work on this radio over the next few weeks and hopefully get it to work correctly. If all had worked as it should have I would have given this radio at least 9 out of ten.